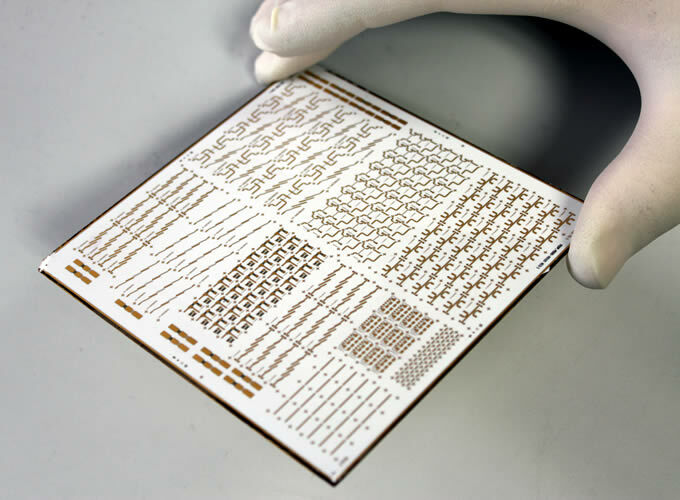 LEW Techniques’ dedicated thin film manufacturing capability offers a build-to-print service for high performance microcircuits on a wide range of materials. 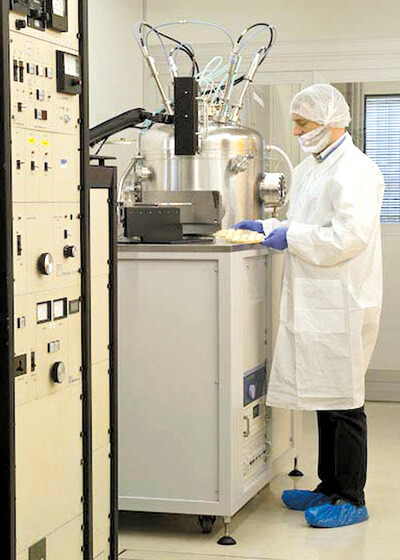 From simple single layer interconnects to multilayer, double-sided circuits with fine lines, integrated resistors, inductors, metallised vias and complex substrate profiles, our manufacturing know-how and dedicated in-house facilities allow us to offer a comprehensive and versatile service for demanding applications. Utilising wet or dry film, positive and negative photo resists and high accuracy mask alignment, fine high density lines and features are resolved to create the desired circuit. Integrated resistors are formed using NiCr or TaN seed layers which are exposed where desired and may be laser trimmed to precise values. 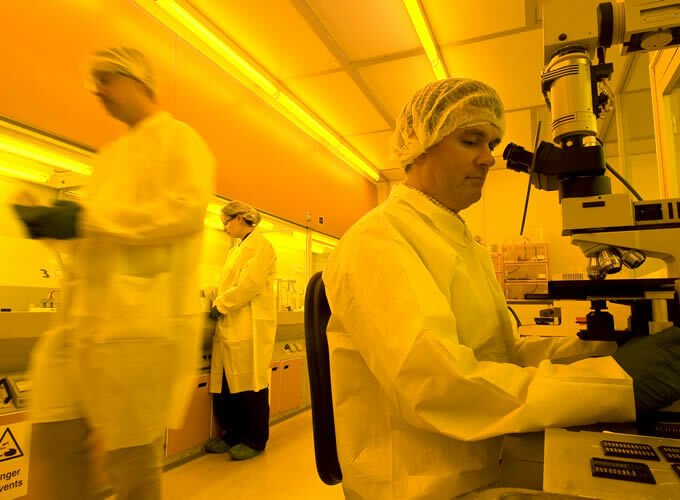 Crossovers, air bridges and multilayer circuits can be realised using photo-imagable polyimide as an insulating layer. Plated thru holes or filled vias can be incorporated to provide localised grounding or front-to-backside connections. 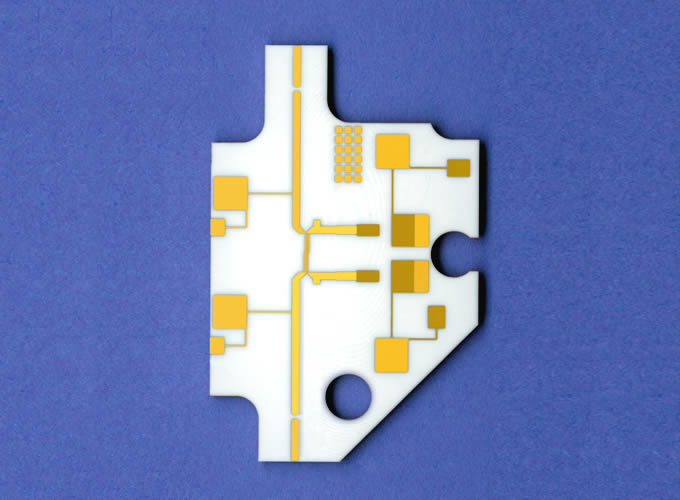 Intricate profiles, pockets, notches and vias can be formed in the substrate before or after metallising. 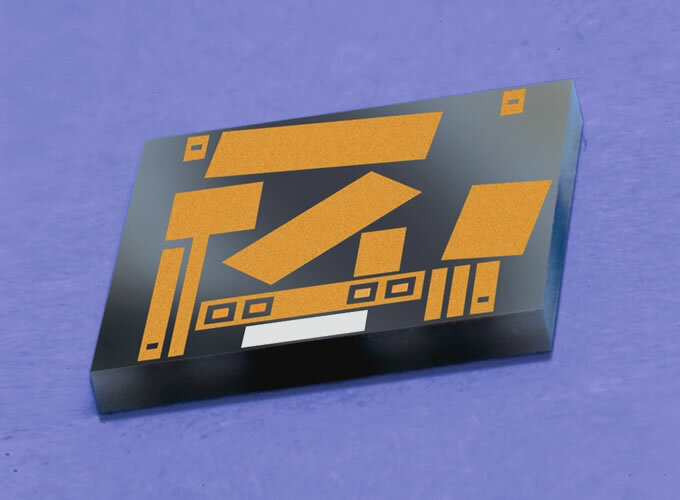 Alignment features, serial numbers and solder dams can also be marked onto the substrate or metallised surfaces. AuSn solder can be selectively pre-deposited onto the conductors. This removes the need to use a solder preform. Alignment, thickness and alloy control are dependent upon the underlying conductor metallisation and component geometry. 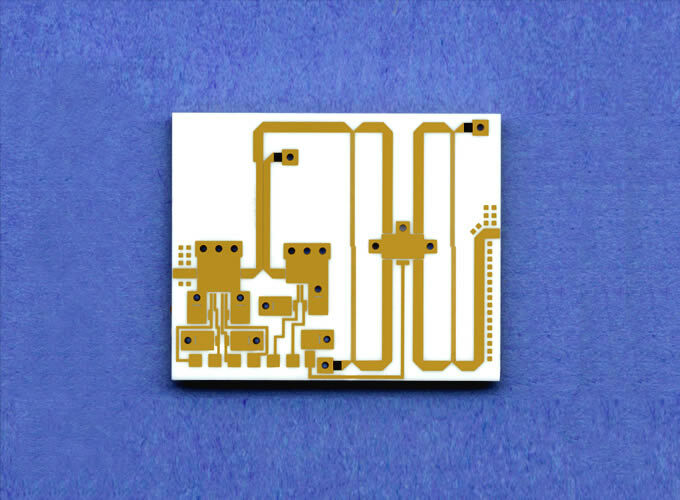 Individual circuits can be singulated from the substrate by laser profiling or by scribe and snap. For best edge quality diamond sawing is the preferred method. Click here to download a copy of our thin film microcircuits design guidelines.